Windows Phone devices have multi-touch screens that give users the ability to use multiple fingers simultaneously for input gestures such as tapping, flicking, and pinching. Windows Phone has multiple mechanisms for handling different kinds of touch input. This Quickstart covers the basics of using touch input in your Windows Phone app. Windows Phone relies on touch for a majority of user input. Windows Phone supports multi-touch screens through which users can use natural gestures to interact with the phone. Adding touch and gesture support to your apps can greatly enhance the user experience. 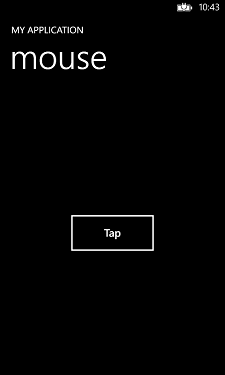 You have several options for handling touch input in your Windows Phone apps. Mouse events. Mouse events can detect simple, one-finger gestures such as tap and double tap. You can add mouse event handlers to your app quickly, and they’re an easy way to get basic touch support. Manipulation events. You can use manipulation events like ManipulationStarted and ManipulationDelta to handle more complex gestures such as multi-touch gestures and gestures that use inertia and velocity data. Lower-level touch events. The TouchPoint class is another way to handle touch input in Windows Phone. TouchPoint is a lower-level input system that isn't covered in this Quickstart. Gesture classes. A fourth way to handle touch and gesture on the phone is with the GestureService and GestureListener classes in the Windows Phone Toolkit. You can download the toolkit from the Toolkit web site on Codeplex. The toolkit is an open-source project and not a core part of Windows Phone. Gestures are a high-level way of interpreting touch input data into a set of common motions such as tapping, flicking, and pinching. Some common gestures used in Windows Phone are described in the following table. A finger touches the screen and releases. A finger taps the screen twice and then releases. A finger touches the screen and briefly holds in place. A finger touches the screen and moves in any direction. A finger drags across the screen and lifts up without stopping. Two fingers press on the screen and move around. You can use Windows Phone mouse events such as MouseLeftButtonUp and MouseMove to support simple, one-finger gestures such as a tap. For multi-touch gestures such as pinching, and gestures that use inertia and velocity data such as flicking, manipulation events are required. The info provided by manipulation events isn't in the form of the gesture that was performed, but rather it is touch data such as position, translation delta, and velocity. This touch data helps determine the type of gesture that was used. It's the responsibility of the Windows Phone developer to convert this information into the equivalent gesture. However, the Windows Phone Toolkit provides gesture support through the GestureService and GestureListener classes. The simplest way to enable touch input in your Windows Phone app is to use mouse events. Mouse events are limited to single-finger gestures such as tap and double tap, and they don't support velocity-based gestures. A single-finger touch on the screen is converted to an equivalent Windows Phone mouse event such as MouseLeftButtonDown when you place your finger on the screen, MouseLeftButtonUp when you lift your finger, and MouseMove when you drag your finger across the screen. Other mouse events that are used by Windows Phone are MouseLeave and MouseEnter. The event arguments for the mouse events are MouseButtonEventArgs. The Click event on the Button class is another easy way to add support for tap gestures on buttons. 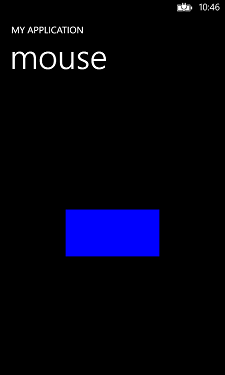 The following example shows how to use the MouseLeftButtonDown, MouseLeftButtonUp, and MouseLeave events to handle a tap gesture on a Rectangle object. First, a Rectangle named TestRectangle is created in XAML and event handlers are added for the MouseLeftButtonDown, MouseLeftButtonUp, and MouseLeave events. Next, event handlers for the mouse events are created. The MouseLeftButtonDown event handler increases the Height and Width of the Rectangle. The MouseLeftButtonUp event handler sets the Height and Width back to their starting values. Finally, the MouseLeave event handler also sets the Height and Width back to their starting value. // Change the size of the Rectangle. // Reset the dimensions on the Rectangle. // Finger moved out of Rectangle before the mouse up event.
' Change the size of the Rectangle.
' Reset the dimensions on the Rectangle.
' Finger moved out of Rectangle before the mouse up event. The following image shows the sample. The next sample shows you how to use the Click event on a Button to handle tap gestures. First, a Button is created in XAML and an event handler is added for the Click event. In the Click event handler, the content of the button is toggled between "Tap" and "Tap Again!". The text changes each time a user taps the button. // Toggle Button.Conten between "Tap" and "Tap Again!" ' Toggle Button.Content between "Tap" and "Tap Again!" If you need to support multiple-finger gestures in your Windows Phone app, or gestures that use velocity data, then you'll need to use manipulation events. You can use manipulation events to detect gestures such as flick, drag, pinch, and hold. The following table lists the manipulation events and classes in Windows Phone. Occurs when a manipulation and inertia on the UIElement are complete. Describes the speed at which manipulations occur. A gesture event in Windows Phone consists of a series of manipulation events. Each gesture starts with a ManipulationStarted event, such as when a user touches the screen. Next, one or more ManipulationDelta events are fired. For example, if you touch the screen and then drag your finger across the screen, multiple ManipulationDelta events are fired. Finally, a ManipulationCompleted event is raised when the gesture is finished. If you're using Windows Phone Emulator to test your manipulation event code and you don't have a touch-screen monitor, you'll be limited in what you can test. The emulator doesn't support multi-touch gestures with the mouse. You can test translations though, as the following example demonstrates. The following example shows you how to use the ManipulationDelta events to handle a drag gesture. The sample creates a Rectangle that can be dragged across the screen. Next, a global TranslateTransform named dragTranslation is created to translate the Rectangle. 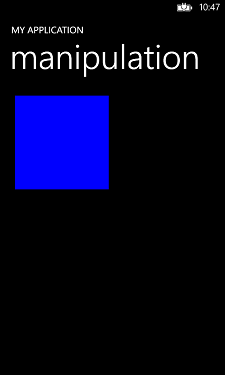 An event handler is added to the Rectangle to handle the ManipulationDelta event, and dragTranslation is added to the RenderTransform of the Rectangle. Finally, in the ManipulationDelta event handler, the position of the Rectangle is updated by using the TranslateTransform on the DeltaManipulation property. All simple commands in your app should be accomplished by using a single finger. Touch controls should respond immediately. Even a slight lag between when a user touches the screen and when the control responds can be noticeable and affect user experience. Provide immediate visual or auditory feedback. If an operation takes a long time, consider providing incremental feedback. Touch targets should not be smaller than 9 mm or 34 pixels. In rare cases, controls can be smaller, but you should never create a control smaller than 7 mm or 26 pixels square. For frequently used touch controls, consider making the controls larger than 9 mm. 2 mm or 8 pixels should be provided between touchable controls. The touch target can be larger than the touch element, but it should not be smaller. The touch element shouldn't be more than 60 percent smaller than the touch target. Oblong controls in vertically constrained UIs are easier to hit.